That's right, our very own professional fishing team has created a contest for all you fisherman/women out there. Mike and Trish from Lucky Bear Fishing have come up with an awesome contest that is sure to get all you anglers out on the lake. What a kick off to the fishing season. The contest has already begun. Running from May 1, 2012 - Dec. 1, 2012. 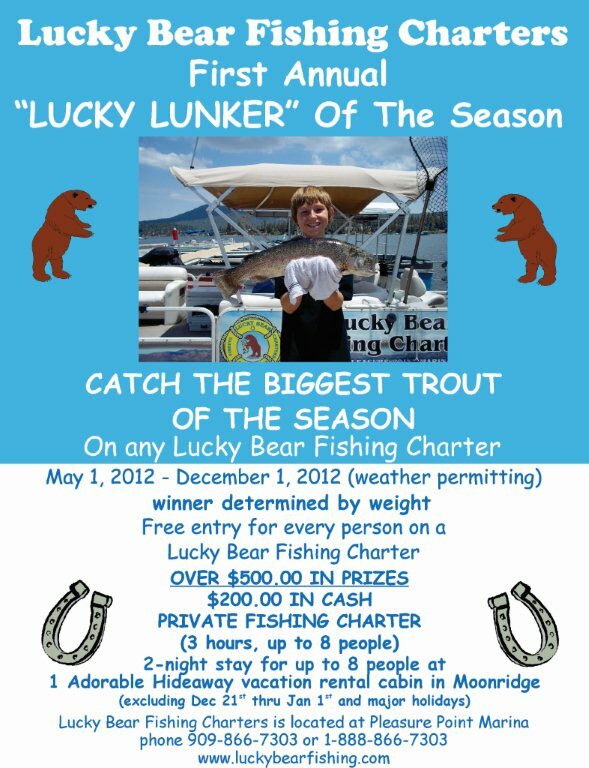 All you need do to enter is go out on an ecursion with Lucky Bear Charters and you automatically get entered to win. There is more than $500 in prizes, $200 in cash. As you fish, your largest single catch will be recorded and held against others who have participated. At the end of the season, approx. early Dec. the records will be audited and the winner will be determined by the highest weight caught. This is the first annual event of its kind but we are certain it will be an event that will be one to look forward to year after year. 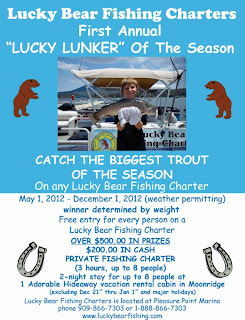 Visit the Lucky Lunker website for more details.